Dell’s Android based tablet ‘Streak’ is one of the most popular devices around and is rated as the top most contender of the iPad. The Dell Streak is a hybrid device that lives in the space between a smartphone and other larger tablets or netbooks in the market and this is where it scores over the Apple tablet. The 10 mm thin device has a 5 inch diagonal screen which provides higher pixel quality and features Adobe Flash 10.1 and Android 2.2. A sharp 5-inch capacitive multi-touch WVGA (800×480) display for a great full-screen experience watching video or browsing the web. Fast 1GHz Snapdragon ARM-based mobile processor from Qualcomm. 5 MP Autofocus camera with dual LED flash that offers easy point & shoot capability and quick uploads to YouTube, Flickr, Facebook and more. VGA front-facing camera enables video chat functionality down the road. A user-removable (and replaceable) battery. A 3.5mm headphone jack means many of you can use the Dell Streak as the music source (and more) in your car. A mono speaker that produces loud sound with less distortion than most other phones. 10 hour battery time per charge. 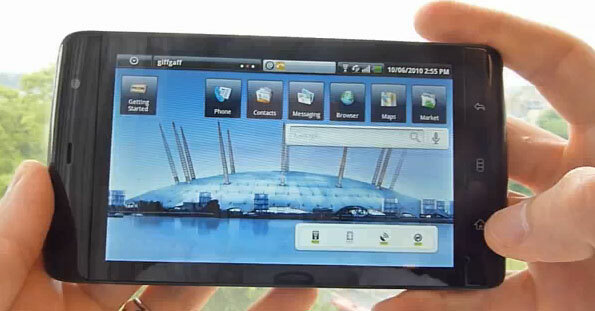 A customized multi-touch version of the Google Android operating system that features Dell user interface enhancements. Access to over 38,000 apps (and growing) via the Android Marketplace. Microsoft Exchange connectivity and integration through TouchDown. Integrated Google Maps with voice-activated search, turn-by-turn navigation and street and satellite views. Quick access to activity streams via integrated social network app widgets like Twitter, Facebook and YouTube. "Photos & Videos" app, which is actually ArcSoft Mobile Media Gallery.